Sunrooms from SRA Home Products allow homeowners in Hockessin, Delaware, to enjoy spending time outside with all the comfort and protection that comes from being indoors. Also, our sunrooms provide homeowners with ample additional living space, which can be utilized in a variety of ways. For example, you can turn your sunroom into an extra bedroom, an exercise room, a place to host parties and gatherings, and much more. What’s more, you can trust that your new addition will be carefully and correctly installed, thanks to the superior craftsmanship of our factory-trained and -certified employees. Our technicians are dedicated to your complete satisfaction, and will provide you with an installation that will surpass all of your expectations. In fact, SRA Home Products has earned an A+ rating with gold accreditation from the Better Business Bureau, so you can be sure that, from sunrooms to screen rooms and other outdoor living products, there is no better business to partner with. 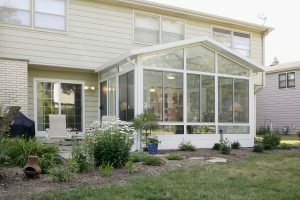 For more information on how sunrooms installed by SRA Home Products improve the daily lives of Hockessin, DE, area homeowners, contact SRA Home Products today. We will be happy to schedule you for a free at-home consultation to determine which of our exceptional sunrooms is best for you.